In 1928, the RLDS church began a quest to find the buried remains of Joseph and Hyrum Smith. The church was worried that rising lake water would destroy the final resting place of the men, and that a more suitable gravesite was needed. The graves were finally found after a difficult struggle to locate the hidden spot where they had been secretly buried. The remains of both Joseph and Hyrum were located under a buried brick foundation of what appeared to be an outbuilding of some kind. The then prophet of the RLDS church, Fred M. Smith, told excavators that the Hyrum’s skull could be identified by a bullet hole through the right side of the face, near the nose. Unfortunately, President Smith was mistaken about the placement of bullet, it was in fact on the left side of the nose and the RLDS church did not have a death mask in its possession for comparison. The skulls of the two men were photographed and their remains were again laid to rest, this time on higher safer ground. These photos remain in the archives of the Community Church of Christ (formally RLDS). Understanding that the two skulls were mislabeled helps us understand which one we should use for a photographic comparison. Unfortunately, the Joseph Smith photo and the photograph of his skull are shot at two different angles, but still tiny details in both tell an incredible story. Below is a side by side comparison of the photograph and RLDS photo. Note the slanted indentation on Joseph's nose in the right picture. What brute force could have created this and was it enough to break his nose? I have always contended that his nose was crooked and appeared broken; something only the unedited photo of Joseph has been able to show. In the left picture you can also see what appears to be a raised scar stemming from an identical indention mark in the nose. 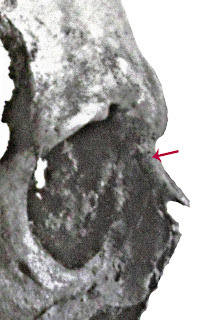 Below is a side view of Joseph’s skull. Note the fracture lines that would be consistent with the broken bend of his nose. I then went to the death mask; would it show any signs of this scar? Remembering that only second and third edition masks were available, I upped the contrast to examine it closer. Each time the mask was copied tiny details were lost but luckily enough remains for a comparison. 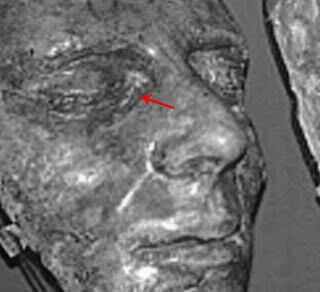 From what I can see from the death mask, there does appear to be a raised scar that runs from his nose to the corner of his right tear-duct, another conformation of this injury. Sadly, this early Mormon prophet had many opportunities in which such an injury could have been sustained and the unedited photograph shows more injuries then just the one we are speaking about. There is scar on his left eye brow and eye lid, which is also present on the death mask. 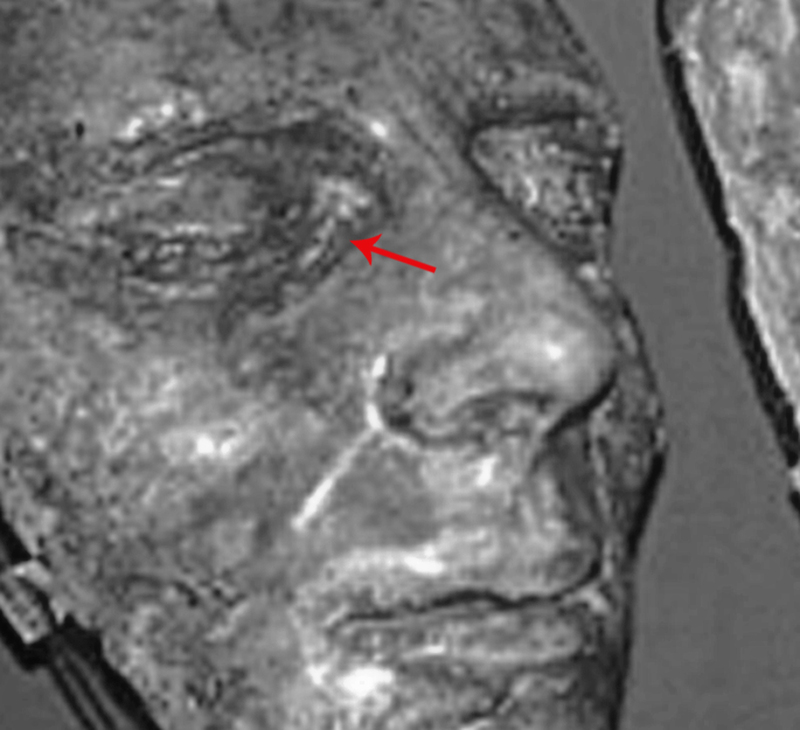 Another scar runs above the right side of his upper lip to his nose, this can be observed on the death mask as well. A personal written account from March 24, 1832, tells of when Joseph was attacked by a mob, the assailants attempted to shove a glass vial of tar into his mouth but it broke against his teeth. With such positive forensic evidence I wonder what argument my critics could come up with. When Joseph Smith III had his father's daguerreotype photographed in 1879, no artwork showed his father's injuries, the RLDS Church did not have a copy of the death mask, and it would be another fifty years before the prophet and his brother would have their graves moved. BTW, that'd be tear-duct, not duck. Quack quack! I worked as a photographer and I am also a beginner painter. I am so happy that you are doing this. I get the feeling that it is Brother Joseph, especially if you read excerpts from books like Remembering Joseph, people made great notice of his eyes and countenance. I hope that someday I could do a painting from an accurate photograph and do it justice. Right now, it's just a dream. Thank you for sharing it. Hi. When I looked at the picture of the Prophet Joseph Smith as published on your blog, I had feelings that it was him. I don't know, but I really felt like it was him. Thank you for this website. I am happy the prophet and his brother have a nice resting place. Kim love the work you did. Your a beautiful person. Thank you for making your photo of Joseph available on the Internet, Kim. I've always felt there was something ever-so-slightly distorted about the Library of Congress photo (itself a photographic copy of the original daguerreotype). Perhaps it's just the touchup work that was done to it that gives me this impression. But my hunch is that, when it was created, the source daguerreotype (obviously a 2D image) was not fully perpendicular to the camera that photographed it, resulting in a very slight 'narrowing' of the image. Regardless, to my eye, your photo does not seem to exhibit this same distortion. Yours is the best image we have of Joseph Smith, and I thank you for sharing it.